Nurtures, strengthens and soothes your skin. Great after shave treatment for men, doesn't have the stinging affect. Scented with Pure Natural Rose Essential oil, the organic aloe barbadensis leaf juice in our formula contains seven of the eight essential amino acids and provides nine essential minerals to rejuvenate and revitalize any skin type for men of color, including sensitive, acne-prone, mature, dry, sun-damaged, oily, normal and combination skin. 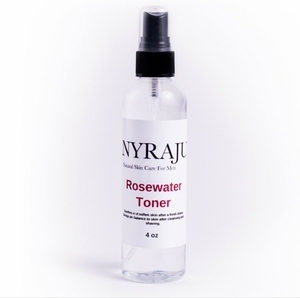 Rosewater not only has a mild and relaxing scent, but also nurtures, strengthens and soothes your skin. Gentlemen, don�t worry about smelling like a rose, the scent is not overwhelming. However the benefits your skin will get is worth every drop you use on it. Works great as an after shave product. How To Use: Morning and night ... Add a little water to a cotton ball or cotton swab, gently remove excess water and add Rosewater Toner to cotton ball or swab. Apply to your face and feel how cool and refreshed your skin feels. Why add water? It keeps you from being wasteful with your toner. 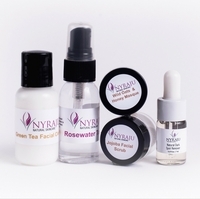 Basic Facial Kit For Normal, Dry and Mature Skin Naturally!